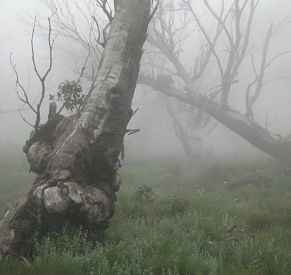 Mount Wills is an extension of the Long Ridge that comes off the eastern side of Mount Bogong. It is a place that lends itself to solitude and contemplation. 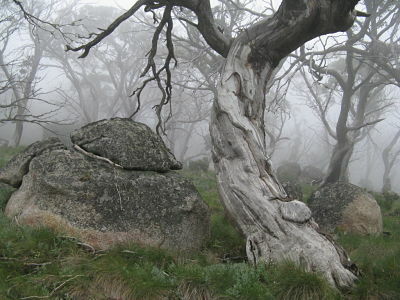 The summit is a broad ridge that drops away into gentle folds of gullies, covered in open Snow Gum woodland, with big old trees scattered amongst the grasses and flowers, all in a giant garden of granite boulders and outcrops. Although the shortest way in, via a 2WD track off the Omeo highway to the Tallangatta ski club, is a mere 3 kilometres, it is often a quiet place. From the summit area, which is ringed by a broken cliff-line and steep slopes on the east, there are fantastic views in all directions, across the Wombat catchment, back up to the High Plains and as far as the Main Range of the Snowies. Low down the ash forests were badly burnt in the fires of 2003 and impacted by the subsequent salvage logging, but the fire damage is patchy across the mountain, and there are still wonderful pockets of older trees. As you climb further into the snow gum zone there are many areas of dead parent trees but also wonderful and widespread zones of old and gnarly elder trees. You often seem to get mist up here and it can be incredibly evocative to wander up the mountain as big old trees and granite boulders loom into view. Many of the people you are likely to meet there are on a longer journey along the Australian Alps walking track. Which is great for finding that elusive silence. There is also an intensive European history, with big towns being established in the 19th century both down at Glenn Wills and also up at Sunnyside on the eastern flanks of the mountain. Sunnyside would have been one of the higher settlements in the state during that era. Its hard to tell now, but there was substantial exploration and mining even up above 5,000 feet on the summit ridge itself, and waterways were cut to channel water for the mining operations. But now days, with a casual glance, it just seems wild and remote, a great place to hunker down and spend some quiet time. But many times when I am up there out of snow season, I find one or two people interested in the old mine works, wandering around amongst the trees. Now thats fine. It’s great to be interested in our heritage. But why are we so obsessed with cattlemen and loggers and miners? As the fires of 1998, 2003 and 2006/7 showed, once the undergrowth has been cleared out, there is a massive wealth of pre invasion artifacts. Camp sites, tools, all manner of things, speaking of habitation lasting perhaps 1,000 generations. And when you have all that silence and space in the mountains it often gets you thinking about things. Like whose country this is. I don’t know the answer to that question. I had assumed Murray Valley tribes. I only have 2nd and 3rd hand stories of the place – mostly these refer to the theory that it is a men’s place. Also that the quartz you find here, including a red quartz, was valued for healing and had other magical properties and was traded way out west, past the Kulin lands and onto the basalt plains. It would also have been a logical destination for people from the south – from the Omeo plains and the Mitta Mitta. There are old camps along the Cobungra and other rivers that acted as base camps where people would stay before heading up into the high country in spring, and it would have been possible to follow the Big River upstream from the camps, launching up onto the ridge line that climbs through ash forest and eventually peaks in Mt Wills. 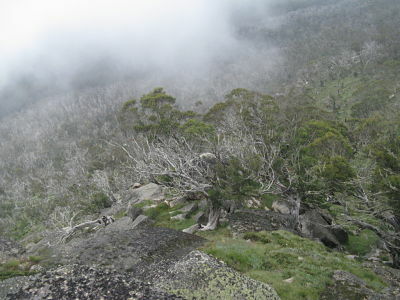 Regional historian Peter Gardner puts Mount Wills in Jaithmathang country, although notes that Upper Murray tribes, who had a friendly agreement about access to the higher peaks during the Bogong Moth season, also travelled to these ranges. He quotes early settler sources (via Josephine Flood) as saying that in the preparation for moth season, up to 1,000 people were seen along the upper reaches of the Mitta Mitta river, waiting to go into the higher mountains. “These figures indicate a seasonal movement of associated tribes and allies into Jaithmathang territory”. Gardner says that “according to the boundaries outlined by Tindale, the Jaitmathang tribe, along with the neighbouring Minjambuta (Mt. Buffalo), almost solely occupied alpine / sub-alpine country. The Omeo tribe have been most commonly thought of as representing the mountain Aborigines of Victoria. It should be noted that although the Jaitmathang and Minjambuta can basically be considered mountain tribes there were a further eight tribes who claimed mountain territory and had access to both high plains and peaks”. “The Jaitmathang country included the high country of Cobungra, Mt. Hotham and the Bogong High Plains to Mt. Stawell and Tongio on the Tambo river in the south, across to Mt. Tambo and Limestone Creek in the east of Tom Groggin on the Indi in the north-east and included the present day towns of Tawonga and Mitta Mitta on its northern extremities. The Jaitmathang country adjoined the Duduroa/ Dhudhuroa and Djilamatang tribes to the north, the Ngarigo to the east, the Brabiralung to the south and Minjambuta to the west”. I remember meeting Eddie Kneebone, a Pangerang man and artist, in the mid 1990s. He had a keen interest in the Alps, and drove much of the early debate about the need to get rid of the name ‘Niggerheads’ for a range on the Bogong High Plains and replace it with an indigenous name. After a long process, the word Jaithmathang (pronounced: Yate-me-tung) was used and four locations were re named after these people in 2009. He seemed to feel that there were very few people with connection to the High Country still, and was actively pursuing re-connection with the mountains. In recent times, members of the Dhudhuroa have re-asserted connection to the High Country to the west of Mount Wills. Russell Mullet, a Gunnai/ Kurnai man, did years of work up around Mount Hotham, doing research into traditional life up in the mountains and suggests that people lived at altitude, well into snow gum country, at least 9 months of the year in places like Long Plain where there was sufficient resources (like a swampy area to provide snakes, eggs and tuberous plants to supplement what could be hunted in the forests). But Mount Wills is a high and narrow ridge, a fair walk from reliable water and light on in terms of animals, except when the moths have arrived. So that brings me back to thinking about what it must have been like, slowly winding up the ridges from the rivers below, passing into the mountains themselves to find old friends and new amongst the granite rocks of Mount Wills. Good feeds after winter, lots of talk and business going on. My Aboriginal friends have often said that the First Peoples had lots of time for art, culture, religion, friends and family, because they could meet their physical needs with a few hours of work a day. Far from being a desperate existence, and without idealising it, you can imagine there was lots of time to wander, to be in that place, to appreciate it’s specialness. I don’t know what happened in this place – beyond the universal human needs of eating, sleeping, and friendship – but some days, sitting in the quiet amongst old old rocks and ancient snow gum I get a glimmer of what it means to have a deep connection to a place. I get that on Mount Wills. A wonderful piece of writing. Thanks for posting. Another place I would love to visit. An evocative piece of writing. I spent a considerable amount of time on Mt. Wills and the Wombat creek catchment in the 1970’s and I felt the lingering presence of the first people. I saw quartz artefacts on creek flats and exposed on mountain tracks and remnants of ancient pathways that had been upgraded to bridle tracks by miners and pastoralists. I’ve never forgotten the power and beauty of this special part of Victoria.